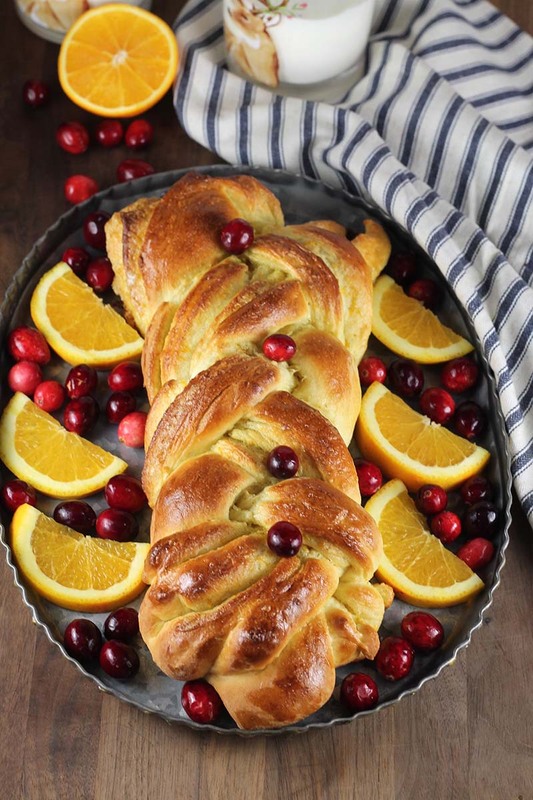 Impress your friends, family and neighbors with this beautiful Orange Cardamom Braided Bread. Garnish with fresh cranberries and fresh orange slices for the holidays. Prepare dough: In a large mixing bowl, add milk, melted butter and eggs into a large bowl and stir to combine. Add sugar and yeast. Stir well and set aside until yeast starts to bubble. Add 2 cups of flour and salt. Stir until combined. Add enough of the remaining flour, about ½ cup at a time, until dough forms a ball. Turn dough out onto a lightly floured surface. Knead dough for 3 to 5 minutes, adding flour as needed, until no longer sticky. Prepare filling: Mix sugar and orange zest together with your finger tips (or use a fork). Stir in cardamom and set aside. Roll into a rectangle about 12 x 15 - inches. Let the dough relax for a few minutes if it isn't wanting to roll out. Spread softened butter over dough. Sprinkle with sugar mixture, spreading evenly over dough. Cut dough into three equal strips (lengthwise). Cut each strip in half (you will now have 6 strips total). Carefully braid 3 strands together, twisting the layers outwards. Repeat with other strands. Place loaves on a lined baking sheet (use parchment paper or silicone mat). Prepare egg wash: Beat egg and water together. Brush over both loaves. Cover, and let rise until indentation remains after lightly touching, about 30 minutes. While loaves are rising, preheat oven to 375°F.